Though aikido is known as a nonviolent, noncompetitive martial art, the use of weapons in aikido was introduced by the art's founder O'Sensei Morihei Ueshiba. The wooden weapons of aikido are most often used as training tools to better illustrate aikido principles and movements and to train in self-defense against weapons. 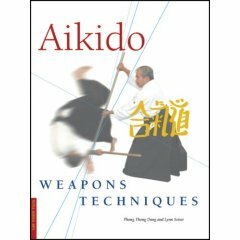 This book features the three main weapons used in aikido: the boken or ken (wooden sword), jo (wooden short staff), and tanto (wooden knife). A complete discussion on each weapon is included with descriptions of the stances, grips, techniques, defenses, forms, and training appropriate for each weapon. The aikido concepts, training and techniques represented are those influenced by the weapons practice of O'Sensei Morihei Ueshiba, as well as the styles of Saito Sensei's Iwama-ryu. Phong Thong Dang holds a sixth degree black belt in aikido, a sixth degree black belt in tae kwon do, a fifth degree black belt in judo, and an eighth degree black belt in Vietnamese Shaolin kungfu. He currently teaches in Southern CA. Lynn Seiser holds the rank of Sandan (third degree black belt) in Tenshinkai aikido under Sensei Phong Thong Dang.